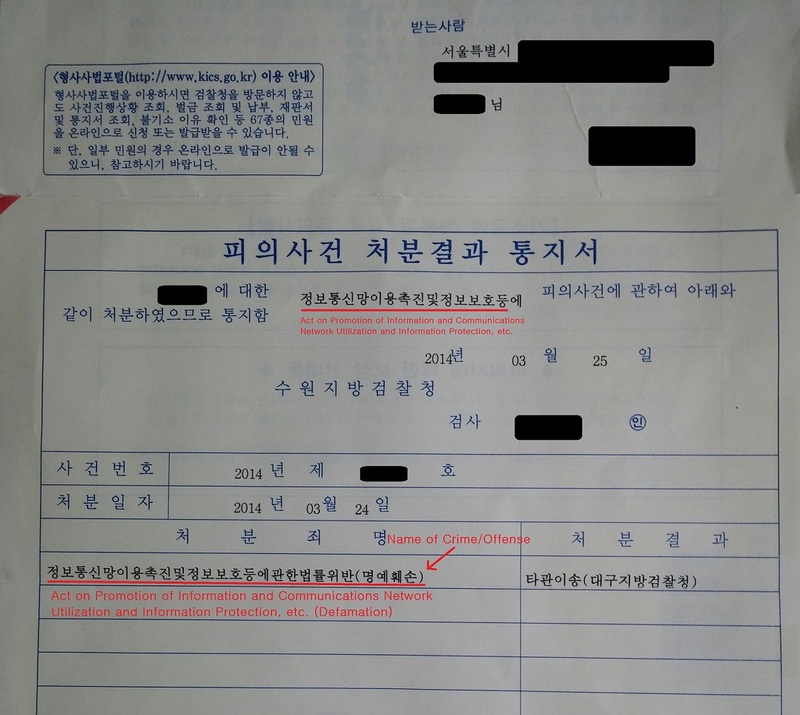 On the day of the Sewol Ferry Disaster last year, a 30-year-old man (here in Korea) decided to fabricate a series of text message exchanges. The exchanges (which were totally made up) made it seem as if the maritime police/authorities were deliberately not rescuing the drowning passengers. The man used two cell phones to make it seem as if he was really texting with a rescuer friend who was at the scene. He then posted on the internet a screenshot of the fabricated text messages. He deleted it ten minutes later, but all hell had already broken loose. Soon, the man was indicted for “Cyber Defamation.” What would become of him? Earlier this month, the Supreme Court of Korea affirmed the appellate court decision which had found that man guilty and sentenced him to one year in prison (no probation). This means he will actually serve time in prison. By fabricating + posting the exchanges, he had defamed the police/authorities who were in charge of the rescue operation that day. 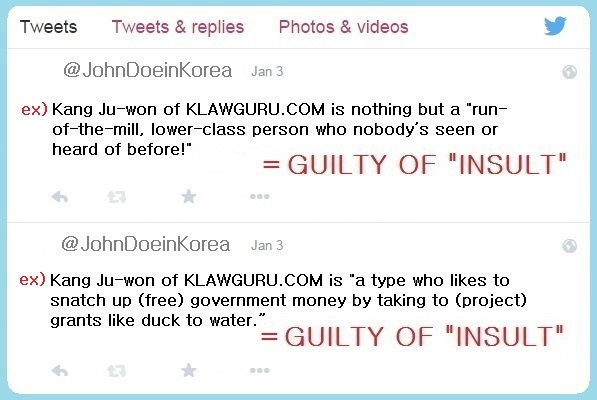 NOTE: In Korea, defamation is a crime, and truth (alone) is not a defense. ADDED: What you’ve just read (above) is an example of “Cyber Defamation” (via a false statement). For an example of “Cyber Defamation” (via a true statement), click here. Simply put, defaming someone online (w/ intent to disparage). 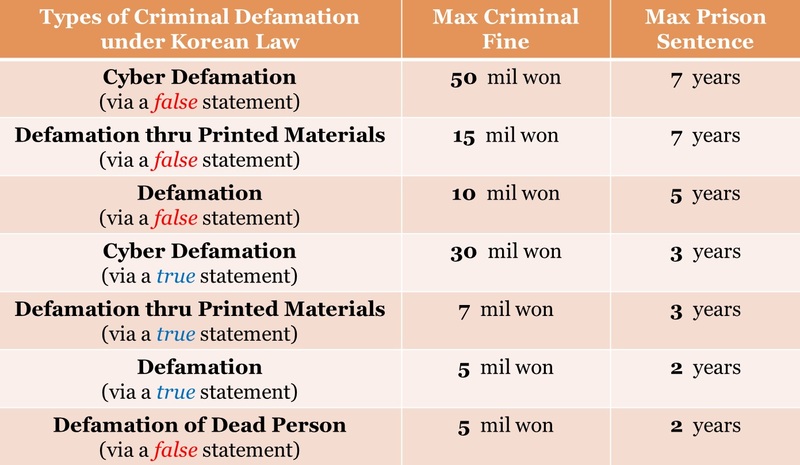 Unlike other Korean defamation crimes, this crime is not found in the Criminal Act (형법). Instead, it’s found in the Act on Promotion of Information and Communications Network Utilization and Information Protection, etc. (정보통신망이용촉진및정보보호등에관한법률). Article 70. “Cyber Defamation” exists in this separate/newer law because lawmakers thought it necessary to punish this type of defamation more severely. When perpetrated via a false statement, the maximum punishment is either 50 million won in (criminal) fine or a 7-year prison sentence! This crime is punished more severely most likely because things tend to spread more quickly online and the damage is more irreversible. Most times, a person who is found guilty of “Cyber Defamation” will end up with a criminal fine. Prison sentences are still somewhat rare. (Actual prison time even rarer.) Prison sentences are reserved for those “egregious” cases where the defamatory statement: 1) was based on a lie + 2) greatly affected the public at large and/or harmed the victim’s business. Which kind of explains why that man was sentenced to prison. Nowadays, “Cyber Defamation” is such an easy crime to commit. (I also know because a family member was once investigated for this crime.) Below is what you would get (in the mail) if you were being investigated by a prosecutor. Although it reads “Defamation,” you can tell the (actual) crime is “Cyber Defamation” because of the law cited. In Korea, it’s a crime to publicly insult another person (w/o provocation). A person who publicly insults another shall be punished by imprisonment or imprisonment without prison labor for not more than one year or by a (criminal) fine not exceeding two million won. In June 2013, the Constitutional Court of Korea reviewed the constitutionality of Article 311. Whether Article 311 (excessively) infringed upon an individual’s freedom of expression. The Court affirmed Article 311 as “constitutional.” Out of the 8 Justices deliberating, 5 Justices saw Article 311 as constitutional, while 3 saw it as unconstitutional. At least 6 votes of unconstitutional are required. 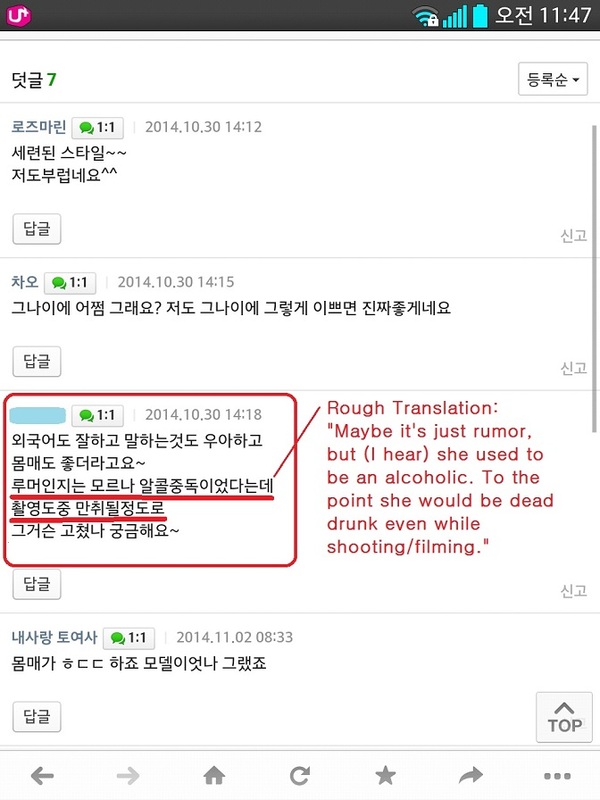 For the time being, people in Korea should avoid online name-calling altogether. It’s by far the easiest way to commit a crime here.